Dudes. 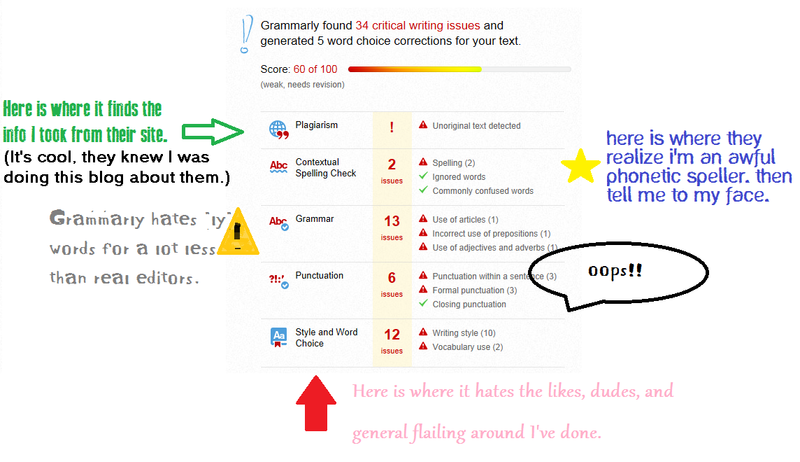 I use Grammarly's Plagiarism Checker, because copying is for bad pop music. And the rest of it? Man, I am in love. So. The secret is out. I hate editing...Wait. You mean that wasn't a secret? You mean I complain about it on Twitter like every week? Er... day? HOUR?! Ok, so quite often I can be found complaining about how much I hate editing to around nineteen thousand of my best friends. Often whining about how it totally ruins my day, week, existence. So it might come as a complete shock to you, that I don't hate editing so very much anymore. Well anyway, it's a shock to me. I admit I scoffed! We all know how good a job Microsoft Weird does checking our grammar. Even Scrivener has failed me recently. (Shorn is so a word Scrive-NERD) So despite the fact that the whole internet is talking about them, I did not have high hopes. Still, the timing was good. I was in edits up to my armpits, so I tossed in the next chapter of my manuscript in. That was all I said, and seriously this writer is never at a loss for words. Never. I went through an entire chapter in just minutes. It takes all the guesswork out of the edit process for me. Often I think something might be not right, but I can't put my finger on it. Grammarly can. It is hard to self-edit. Grammarly kept me from having to re-read the same scene until the words spun off page and I'd start wondering if I wrote the whole damn thing in some obscure dead language. The very next thing I did was email my editor asking him to go over my edited text--and see if it really is as great as I thought it was. I had to wait until the next day for my answer. Apparently editors need sleep. Whereas I previously thought they were too evil for it. The answer was amazing. "While it didn't catch everything," he starts.... it was about ninety percent cooler than what I normally turn into him. And I mean, he couldn't say it's perfect right? Editors got to eat too. 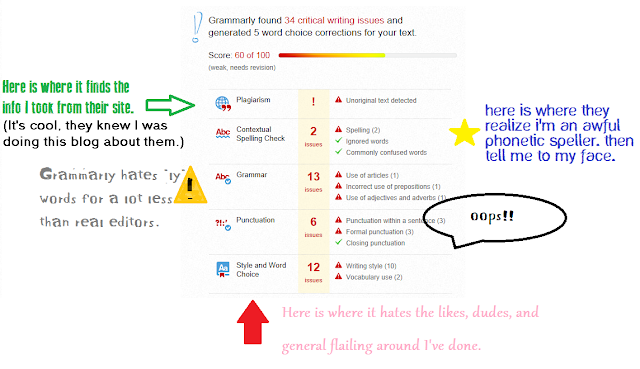 For kicks, I am going to throw in this blog post pre-edit to see what Grammarly finds. So as you can see, I'm an awful writer. No, that's not right. As you can see, Grammarly gives you a "score" out of 100. As you correct things your score goes up. I don't know about you, but my adult self still likes to get A's. No one wants to write a D- of a book or even a blog post. Grammarly makes it all so easy, I forget that I am editing and not just playing some crazy word game all the Grammar Nazis think is cool. On Grammarly.com they have an awesome list of TOP TEN REASONS YOU SHOULD USE GRAMMARLY. I'm partial, so I think mine's better. #10 Sometimes it pays to be the smartest one in the room. Let's be honest, in writing everyone is trying to out do everyone else. To be the best you have to be the best at something. Why wouldn't you jump on the chance to make you and your book more professional with something that doesn't require your firstborn child. #9 Everyone is a critic. As a writer, you spend a fair amount of time trying to make other people happy. If you claim you don't you're a terrible liar. There is always someone. You might be writing your books for you, but then there is always the agents/editors/publishers/readers/and other critics of the world. Don't give them something easy to complain about. #8 Self-editing is hard. Being burned at the stake for being a bad self-editor is worse. #7 Grammarly has 20k Twitter followers (a little more than me!) but editing is not cool--therefore Grammarly must work fabulously! Because no one wants to hang out with editing at a party. #6 All the cool kids are doing it. While I am big into being original, there is something called a grading curve. You might be shocked to realize this applies to writing and real life. If everyone else raises their standards, you have to raise yours or you won't be able to compete. #5 Real Editing comes in tiers, like substantial, basic, and copy-editing. Grammarly plans also come in tiers, but theirs are all for a very small fraction of how much you'd pay for a first edit. #4 Use it and abuse it for one low price! So you get your manuscript back from the editor, and it has red lines all over it! What do you do? You fix it of course. Only sometimes the fixes aren't as cut and dried as we like and most editors don't include a second (or third, or tenth) look in their price. Grammarly does. #3 It's not cool to wait in line. Say you want someone (anyone!) to look at your book. Did you know that most awesome editors have serious wait lists? In addition to the time you'll spend on that, it also takes weeks for them to get back to you when they do start your book. Do I think you can go editor-free when you use Grammarly? I can't, but I can skip to the copy editing part which saves time and money. Comma people probably could though. #2 Real editors need sleep (those bastards). Feel free to use Grammarly at three in the morning. I do. #1 Angela Kulig recommends it! Hey, that's me~! The Fine Print: Grammarly sponsored this post... but they didn't actually plan on me talking about them. They said I could write about whatever I wanted. I decided to write about Grammarly because I am seriously into writing innovation, and I want my friends to be into it to. I love Grammarly, but that wasn't a requirement. I have always been sceptical of grammar checkers, but this... this looks cool. And I've heard good things about it from more than one person. I think I'll use it on a short story I already had published in a magazine (and which was professionally edited for said magazine). It'll be interesting to see what it comes up with!